I used to think of Veterans Day as a day to celebrate those who served in World War II or other wars I never saw in my lifetime. I’d see older gentleman in the grocery store or out and about and see”Veteran” across their caps and not think much of it. It wasn’t until I married my husband that I learned a Veteran is anyone who has served, at any point, in any military branch. And it wasn’t until then that I realized how truly important a veteran was. As a military wife, pictures are one of our biggest treasures. When our husbands deploy for months or years at a time, it’s the pictures that provoke memories that get us through the time apart. We take pictures to document the holidays and birthdays our husbands miss. We take pictures to show them milestones as their children or our bellies grow. And we take pictures when they return home safely, out of danger and harms way. 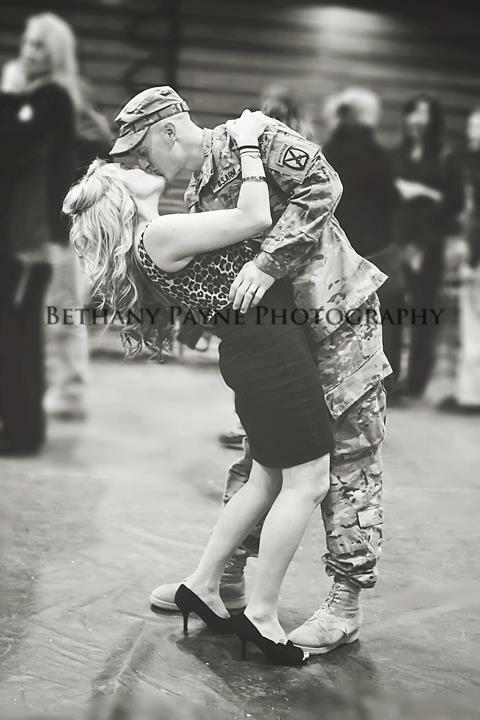 The picture above is one of my favorites; after a long 10 month deployment, just a month after getting married and then pregnant, this kiss was a long awaited moment I had dreamed about night after night. If you have a second, thank a veteran. If nothing else, say a prayer for them, their families, and the difficulty the lifestyle may sometimes bring. Although our soldiers chose this job, they have selflessly given up so many luxuries so that they may protect our country. And for that, we should be forever grateful. Thank you to all of those that serve: past, present, and future. God Bless you all. Wahl is a leading manufacturer of hair clippers, facial hair trimmers and other personal care products. They are a family owned company based out of Sterling, IL and all products are made in the USA. You can visit them on Facebook here. « Proud to be an American.